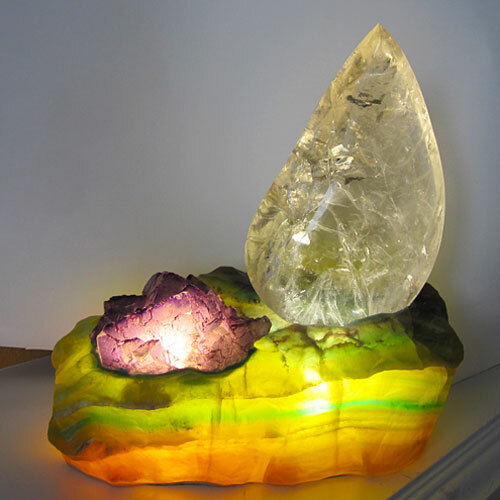 We have found that crystal lamps can amplify the energy of crystals and minerals, reflecting it outward, filling space with a colorful, healing energy signature and assisting in keeping your space free of interference and detrimental energies. Call us at 561-910-1871 or email us if you have questions. Digital Paintings, Photos, Mixed Media, Drawings Personal Talismans and Artist Books. Jane’s work is in the Getty Museum, The New York Public Library, The Library of Congress and more. Reiki Masters Curtis Lang and Jane Sherry offer distance and two-person Reiki treatments, and Reiki classes. Treatments can include aromatherapy, flower essences and/or crystal work. Curtis Lang has performed thousands of Tarot readings. Tarot readings track probable futures in order to see the most likely outcomes of unfolding present situations. Tarot also provides the psycho-spiritual tools to enable us to change our own future in a positive way. Satya Center counselors Curtis Lang and Jane Sherry are Reiki Masters, certified past life therapists and Interfaith Ministers. Sessions usually last 30-60 minutes in person or by telephone. Sessions are based upon a variety of vibrational healing modalities, meditation and prayer. For the first time ever, ONLY at Satya Center: FREE newly updated chapters from Marcel Vogel’s how-to book on crystal healing. How to pick a Vogel wand and how to use a Vogel wand in healing and meditation. Your FREE A-Z guide to the metaphysical and mineralogical properties of quartz crystals, minerals and gemstones used in healing and meditation. New FREE E-book! Discover the origins of Lemurian Seed Crystals. See pictures of the Lemurian mines in Brazil. Discover how spiritual teachers of the East and West have used crystals, minerals and gemstones in spiritual practices, meditation, and healing for thousands of years. Just wanted to let you know how much I love the citrine flower of life!! The photo was wonderful but even that didn't do justice to the beauty of this crystal. It's amazing! — Tina V.
Thank you for the very apt description of the physical and spiritual environment we are currently in. I truly appreciate your taking the time and Energy to share your insights . Wishing you many blessings in your new home. Namaste. — S.C. Thank you both …. For elegantly describing what I have been feeling and trying to verbalize … now I can send this newsletter to others who might benefit … thank you also for the guidance in navigating through this time. Much love, I.
Dear Satya Center: I received my moldavite necklace and want to say thank you so much. Not only is it beautiful, the packaging was very secure. As soon as I opened the box, I FELT the beautiful energy of your intention of love and light. To the packer Jane, I appreciated the handwritten note. It is clear that you take great pride in what you're selling. As a reiki practioner, I immediately picked up on the positive energy in the items that was used to pack the necklace. I will definately order from you again. Thank you and may the blessings of grace and harmony be with you all. Sincerely, J.B.
Dear Jane and Curtis: The aquamarine wand pendant arrived. It is beautiful! It arrived with a most lovely ruby crystal today. Thank you so much . . .and it was packed so well! Packing is so important, because the crystals had traveled for thousands of miles. What you wrote about giving the ruby back to Earth, moved my heart. I have always thought that way too, that we took so many crystals from Earth. I will find a good place with trees and or plants and or flowers for the ruby crystal. Thank you for your big generous heart, both of you and your staff members and families. Bless your company! I just took a photo of the wand and ruby, for my heart and yours. — G.Y. Hello Curtis, Thank you for your big picture socio-political-economiic insights from the astrological vantage point. Thank you for you encouragement to explore the spiritual side of our lives, and your suggestions to practice specific meditations for the changing seasons. Also thank you for the short historical causes of the seasonal festivals. Your emails are insightful and I look forward to read what your viewpoints are. You and Jane remain strong and well. Sincerely, John C.
I am excited about getting the little being. I think that I have been to every crystal website looking for Phenacite (and a few shops in Indy) not one came close to your beautiful Phenacites...You also impressed me by answering questions that came up when you could of just brushed it off- so thank you. It is very appreciated. You two are amazing Light Beings!!!! I could not NOT write and tell you how much I LOVE your newsletters, the work that goes into them and your web site is immense, and your Souls are shining Stars bursting forth with Divine Light upon this Mother Spaceship we call Planet Earth. I fold my hands in front of my heart of Hearts and humbly say NAMASTE to the 2 of you. This month's newsletter was particularly amazing as its words were like "much needed rain to our drought stricken inner landscape" - pun intended! I feel soaked to the Core in a shower of Grace. Deepest gratitude. We'll talk soon, BIG HUG, All my respect, and Hugs from my Heart to Yours……A. W.
Thank you for printing the lost articles by Marcel Vogel. I am a Reiki master Teacher and had an unbelievable opportunity to receive an original set of Marcel Vogel wands (square healer and meditation wand) in a beautiful wooden box. I am printing out your articles on this amazing man. i have used the wands and want to understand more. Thank you deeply, R.
Hi Curtis, I hope you are having a wonderful day! Thank you very much for the Reiki session. I have been paying attention to how my foot has changed since then. Right after the session I could feel a reduction in the swelling which has continued. I also became aware of some anger associated with the injury I had not dealt with. I am aware that I need to make peace with the metal in my foot as that is where the pain is when I walk. I am so grateful for the treatment! I saw so many colors during it and loved that you used your wands. I have not had that experience before! Thank you again!!! R.
I received my blue crystal Tool Of Evolution crystal today and was very pleased with the energy and extra touches you folks put together with it. It has already begun to manifest beauty in my world and I really love the rubies for planting concept. I know I am doing business with the right people and will not hesitate to continue doing so in the future. Thanks and brightest of blessings to all. — H.C. Copyright © 2003-2019 by Satya Center. All Rights Reserved. Permission is required for reproduction of any part of this work.